The NET232+ is the next generation of advanced serial device servers from Grid Connect and s backward compatible with the NET232. The new “PLUS” provides a simple solution enabling RS232 serial devices to connect to the network via Ethernet and TCP/IP (RJ45). Use the NET232+ to extend the life and utility of existing RS232 serial devices. The NET232+ is a fully featured device server supporting multiple TCP connections (up to 4 TCP or a mixture of TCP and UDP), DNS, email serial triggers, email authentication, and 256-bit AES encryption (at no-additional charge). Serial data rates up to 921K and auto-sensing 10/100Mbps Ethernet are supported. The NET232+ also features an industrial grade temperature range, detailed LED status indicators, and a factory reset push button. 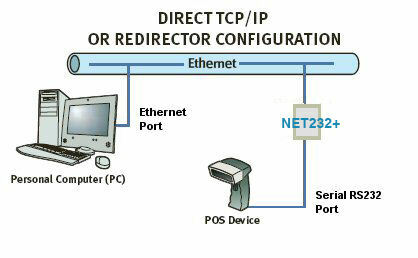 The NET232+ is simple to configure using the provided installation software and web page. Just connect the adapter to a serial device and to the local Ethernet network and run the free software to find and set up the NET232+. 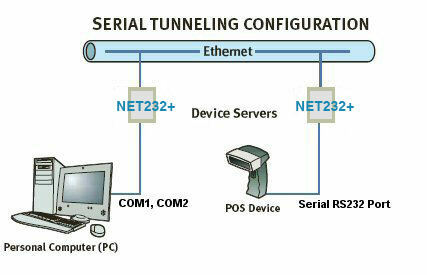 The NET232+ can be used in pairs to “tunnel” serial data over the internet, or as a single device connected to a serial device on one-end and to a “virtual COM port” on a PC on the other end. This is accomplished using the free virtual COM port software.